If your bank supports downloading transactions to a CSV format (a comma-separated values format that can be read by Excel), you can download your banking activity to a CSV format and then import it into your QuickBooks Online Bank account. First, log in to your bank’s website and save your banking transactions. QBO can import CSV files formatted in either three or four columns. This is what it looks like in a four-column format. Choose Transactions → Banking in the Navigation bar. Click the arrow beside the Update button and, from the menu that appears, click File Upload. The Upload File page appears. Click the Browse button, select the CSV file you downloaded from your bank’s website, and click Next. Select the account into which you want to import transactions and click Next. On the Map CSV Columns screen that appears, match the fields in QBO to the fields in your CSV file and then click Next. The transactions you can import from your CSV file appear, with a check box to the left of each transaction. To avoid importing a particular transaction, select its check box. QBO displays the number of transactions that will be imported and asks if you want to import the transactions. Click Yes to import the transactions. When QBO finishes importing the transactions, a confirmation screen appears. The Bank and Credit Cards page appears, and the transactions you imported appear on the New Transactions tab. 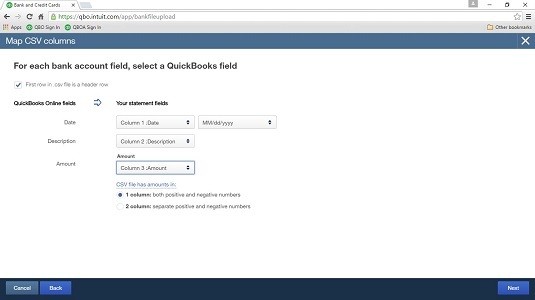 Match QBO fields to the fields in your CSV file.